1. The only piece missing is you! A personalized puzzle is an adorable way to ask your friends to be in your wedding. And it makes a cute keepsake they can frame and hang on their wall! 2. Here’s what we’re going to need to have a good time. Are you in? 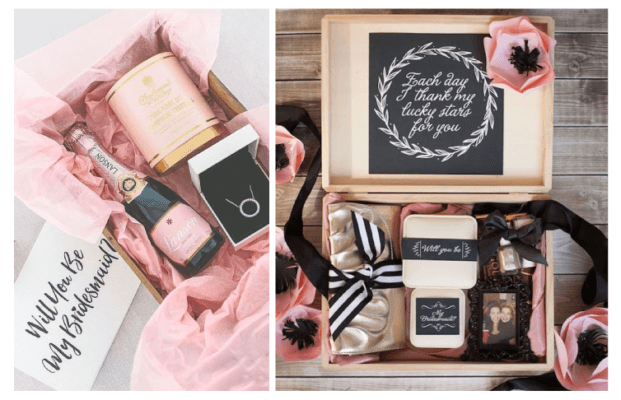 A bridesmaid box or wedding kit has everything your girls need to have fun before the big day: drinks, nail polish, chocolates, candles and whatever else means the most to you and your squad. 3. I can’t tie the knot without you! These pretty bridesmaid hair ties are both practical and pretty! 4. Will candy convince you? 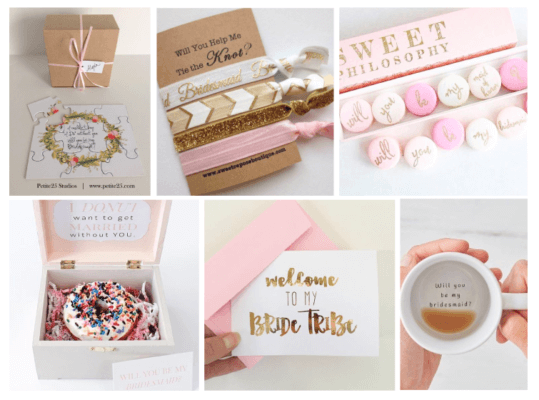 Sweet candies with a personal message are one tasty way to ask your friend to be a part of your wedding day. 5. I donut want to get married without you. 6. First drink your coffee, then say you’ll be my bridesmaid. This special personalized coffee mug is something your friends will treasure long after your wedding day. a personalized card is the perfect invitation for your girls to join your wedding party. 7. A special card for a special request. Whether it’s hand-lettered, hand-painted or just the cutest printed card, a personalized card is the perfect invitation for your girls to join your wedding party. 8. Your friendship is a gift, so I got you something special. Your best friends probably mean the world to you, so why not give them a gorgeous little token of your appreciation when you ask them to be in your wedding? A bottle of champagne with a cute necklace, bracelet or earrings would be a generous touch, and they can wear the jewelry on your wedding day! The team of wedding planners at Creative Destination Events knows all the most original ways to pop the question to your Cabo bridesmaids. Contact us to learn more today! This entry was posted in BEACH WEDDING, CABO WEDDINGS, DESTINATION WEDDINGS, LOS CABOS WEDDING PLANNER and tagged Cabo Bridesmaids.